Titan’s annual celebration and fundraising event, The Titan Annual Dinner, is an opportunity to celebrate the networks achievements and successes and to help raise money for activities directly benefitting those young people who need them most. Hosted at the University College Birmingham (UCB) award-winning restaurant, The Brasserie, and attended by senior leaders and stakeholders from across the education sector the event is always a superb opportunity to network and provides invaluable work experience for the students at UCB. ‘The Titan Annual Dinner is one of UCB’s highlight events of the academic year. 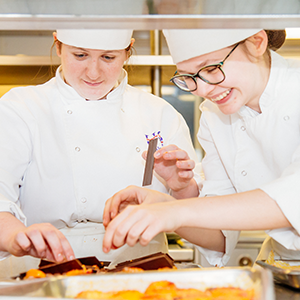 Our students have always benefited hugely from the hands-on experience this annual event provides with Front of House, Chef and Bakery students all playing key roles in its planning and execution. Students have the opportunity to practice their teamwork and leadership skills and also to engage with education leaders and key supporters of these organisations, which is invaluable in developing their confidence and communication skills.